Collier Research Corp. (Hampton, VA) says that its newly released HyperSizer version 6.4.5 composite structural analysis and optimization software not only runs much faster than earlier versions but that it’s now based on a reconfigured core technology with built-in “intelligence” that produces more accurate answers with less user input. 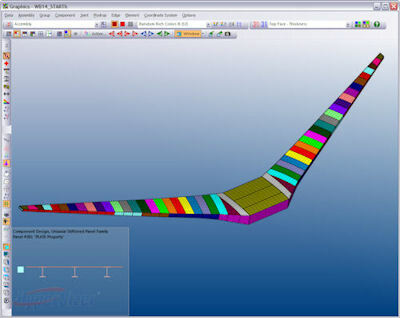 This HyperSizer screen shots show wingbox FEM structural sizing components being defined. The colors represent stiffened skin panel bays. Image courtesy of Collier Research Corp.
An example of updating FEM and CATIA with an optimized design. Track and View Laminate Global Ply Coverage capabilities are shown. Image courtesy of Collier Research Corp. The analysis engine of v6.4.5, says the company, takes advantage of HPC (high-performance computing) technology to speed up runs by 200 to 400% across the board. Optional quick sizing and variable tuning capabilities are said to be as much as 1,000 times faster. The new version now also supports nonlinear and dynamic load stepping Abaqus and Nastran FEA solutions. For the wind industry, weight/cost optimization has also been added to enable engineers to include the effects of material choices on tools, labor, facilities, etc., when studying tradeoffs between carbon fiber and fiberglass. 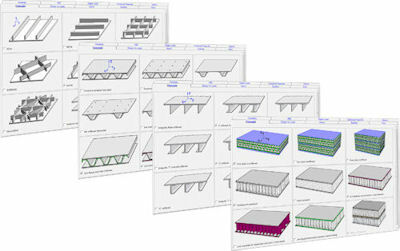 HyperSizer offers users the ability to choose from more than 50 panel and beam concepts. Image courtesy of Collier Research Corp. Version 6.4.5 also offers a new FEA Load Extraction Method called “Peak Element” for projects with many load cases. Peak Element is described as filtering out from the hundreds or thousands of the critical load cases based on their magnitudes and not on any failure mode analyses. Other enhancements include ANSYS components now import as HyperSizer assemblies; export of CATIA “thickness law” and “virtual ply” data for direct import into CATIA; cross-section visualization and property calculations; and support for fatigue-only load cases.